This week Vice announced their new SFF magazine, Terraform. As mentioned previously in this column, new 'zines are always coming along and this is good news most of the time. However, Terraform's birth was not the occasion for celebration, but a throwdown. The mission statement/announcement starts out making some interesting assertions, such as: "...weirdly, there's a distinct dearth of science fiction in its purest, arguably its original, form—short fiction—in the environment to which it seems best-suited. The internet." and "...it's strange that there isn't more fiction commingling with the newsy posts and personality quizzes and status updates tumbling down our feeds..."
The first version of the post made it sound like there were no online SFF fiction magazines in existence or of note, but the post was edited a few hours later to correct this mistake once SFF authors, editors, and fans came into the comments with the mallet of loving correction. Many were put off by Terraform's attitude and feel it not only betrays an ignorance of existing magazines but an ignorance of the SFF community as well. Given the audience they're hoping to target, that might not affect the success of Terraform much. However, their stated goals just might. I'm not as positive as Charlie Jane about the overall mission of attempting to publish spec stories that resonate with what's going on in the news as that news happens. SFF does this naturally, of course, just not usually that same week or same month. Plus, stories that are inspired by what's going on in the world now may not be directly about those things. Writing SF that directly relates to the news or emerging technologies requires a deft hand to not feel like preaching or merely capitalizing on the latest hot science news. Probably one of the best writers doing that today is Cory Doctorow—who has a story in the inaugural issue—and (forgive me world) a lot of the time his fiction comes off as being more about the issue he's trying to raise than about the characters or the plot. 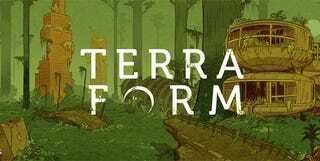 If Terraform is going to be a magazine of nothing but stories in that vein, I'm not too sure I want to read it. But I'm well aware that I'm in the minority in feeling that way about Doctorow's fiction and thus may be in a minority for not being eager to read a magazine like Terraform. I'm most interested in what the readers of io9 think of the 'zine. I invite you to read the four stories in the first issue and tell me what you think of them individually and/or as a whole. In the meantime, here are my favorites from the week. The birds gather wherever there has been a death. Black birds, with eyes of pale, moonstone white. They are there for the soul of the person who has died, and they are there to embody the grief of those who are required to mourn. It was an appalling thing, to be chosen as a mourner, to feel the tiny claws of the bird's talons clutch at your skin. Mourning meant isolation from society, the need to drape oneself in heavy, black clothing. Neither to dance, nor even to listen to music, nor to eat foods of particular richness or flavor. To become like unto one of the dead oneself. Love the imagery of the birds here and how elegantly Howard spins out the metaphor for grief that they embody. Those of you who enjoy beautifully crafted prose and baroque imagery that doesn't feel overwrought will really dig this story. I chose this story for the idea of the city—why it exists, what it's made of, how women move in and out of it. I must admit, the actual story of the characters felt a little light to me, but the imagery of the city seized me and wouldn't let go. Straddling the worlds of the mundane and the magical, Spirits Abroad collects 10 science fiction and fantasy stories with a distinctively Malaysian sensibility. I'm in the midst of reading Spirits Abroad, a collection by Zen Cho, and deeply enjoying it. It contains ten stories grouped into three sections: Here, There, Elsewhere. Elsewhere contains the most speculative of the stories, where as Here and There are more what the literary world terms magical realism. So far my favorite story is The House of Aunts, but I expect that when I'm done there will be several I can't stop thinking about.